In human rights work these days it can feel like there are more defeats than there are victories. But yesterday PEN America and our supporters and allies around the world let up a cheer. Thanks to your support Ahmed Naji, winner of the 2016 PEN/Barbey Freedom to Write Award, was freed from prison, becoming the 37th out of 40 PEN award winners to be released from jail thanks in part to the publicity and pressure generated by the Award. Ahmed should never have been imprisoned in the first place. His only crime was writing a sensual scene in a novel that supposedly gave a reader heart palpitations. But prosecutors were relentless, pursuing their case against him not once but twice and securing the maximum 2-year sentence. PEN America mobilized 120 prominent writers to sign a letter demanding his freedom. 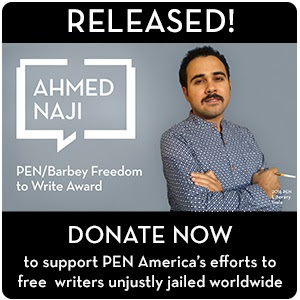 In May, PEN America awarded Ahmed the PEN/Barbey Freedom to Write Award at our annual Gala. We asked all our guests to pen handwritten notes to keep Naji’s spirits up and then had those shared on social media and sent in hard copy to Cairo. J.K. Rowling, Sarah Jessica Parker, Kathy Bates, Donna Tartt, Salman Rushdie, and hundreds of others shared personal words with Ahmed. Suddenly Ahmed’s freedom was a global cause. PEN America continued to keep Ahmed’s case in the spotlight, mobilizing partner organizations and sharing news of his appeals with tens of thousands of supporters worldwide. Yesterday, thanks to your efforts, a court ordered Ahmed freed. We thank everyone who took part in this campaign, and especially Peter and Pam Barbey for their passionate support for the Freedom to Write Award. Please join PEN America in celebrating Ahmed’s freedom.